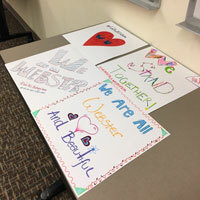 The pieces will be displayed around the home campus as a statement that all are welcome at Webster. The Office of Student Engagement began an ongoing public art project Dec. 5 for students, faculty and staff to express messages of solidarity in the face of a hate incident on campus. The theme of “We Are All Webster," is a statement that everyone is valued at the University and that the community stands together to welcome and support one another. Students, faculty and staff met in the West Hall Multipurpose Room, creating colorful posters while engaging in lively discussions about what they can do to make Webster University community members feel included and connected. Submissions are still being accepted and can include any form of creative expression including but not limited to "I am" statements and personal identity descriptors, selfies, messages of solidarity with marginalized populations, etc. Pieces will be accepted at the Office of Student Engagement, West Hall Housing Office, Office of First Year Experience Programs and the Multicultural Center and International Student Affairs department. Contact Jennifer Stewart, director of the Office of Student Engagement, at 314-246-7106 or jstewart15@webster.edu, for more information.